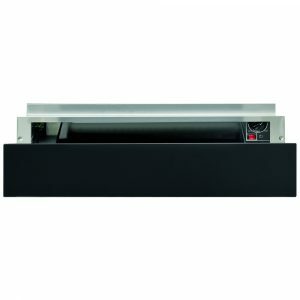 This superb warming drawer from Whirlpool is 13cm high and is finished in black. It is perfect for warming food or crockery. This superb black glass warming drawer from Caple is 14cm high and is perfect for warming crockery. With fan heating, push/pull opening, a 90 minute cut off timer and 30-75°C adjustable thermostat, this warming drawer is the perfect addition to your kitchen. It is extremely rigid to support the weight of an appliance on top, and as heating up dishes for a meal for 6 people to 75°C takes approximately 4-5 minutes you can have warm crockery in next to no time. The perfect accessory for any family dinner. 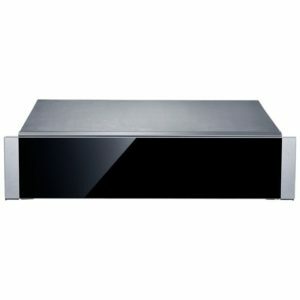 This superb stainless steel and black glass warming drawer from Caple is 14cm high and is perfect for warming crockery. With fan heating, push/pull opening, a 90 minute cut off timer and 30-75°C adjustable thermostat, this warming drawer is the perfect addition to your kitchen. It is extremely rigid to support the weight of an appliance on top, and as heating up dishes for a meal for 6 people to 75°C takes approximately 4-5 minutes you can have warm crockery in next to no time. The perfect accessory for any family dinner. 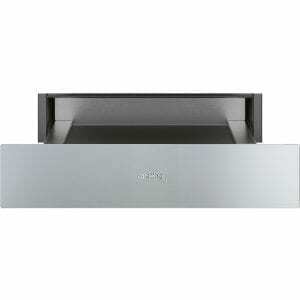 A superb storage drawer from Smeg, this stainless steel finished drawer measures 15cm high. It is perfect for storing crockery with a generous 21 litre capacity and a weight limit of 15kg. A non-slip drawer liner will ensure all of your accessories remain in place, ideal if you love organized drawers! The handleless push pull opening mechanism provides a sleek and streamlined appearance so that your kitchen has a minimalistic look. This accessories drawer is suitable for fitting directly below a 45cm high compact oven. The great accessory drawer from Neff is perfect for popping in plates, utensils or cookware to store when not in use. Designed to match other items across the range it looks fantastic as part of a gallery unit with a modern, handle free front. Simple to use with push-pull opening it can hold up to 14 plates easily.